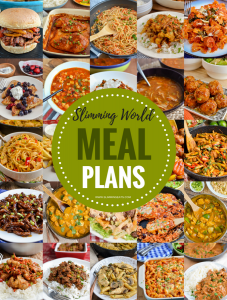 Low Syn Healthy Butter Chicken – the ultimate Slimming World Indian Fakeaway dish, with healthy delicious ingredients that don’t compromise on flavour. I love Indian food, it’s one of my favourite take-out choices and has been since I was a little girl. I can still remember my first meal at an Indian restaurant. My dad used to a do a lot of work at Indian and Chinese restaurants, so I was accustomed to that kind of food from a very young age. Below are some of my own versions of those first dishes I tried. 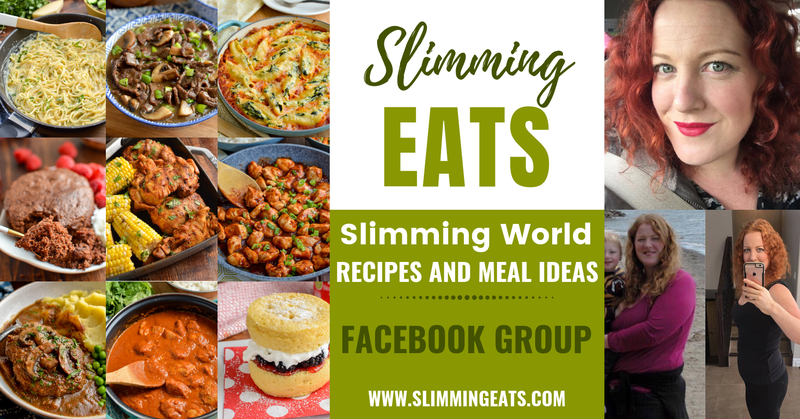 As well as those, there are as many more Indian recipes in my Fakeaway section, or head on over to my FULL RECIPE INDEX where you will find over 800+ delicious Slimming World recipes, all fully searchable by ingredients, meal type, syn value etc. 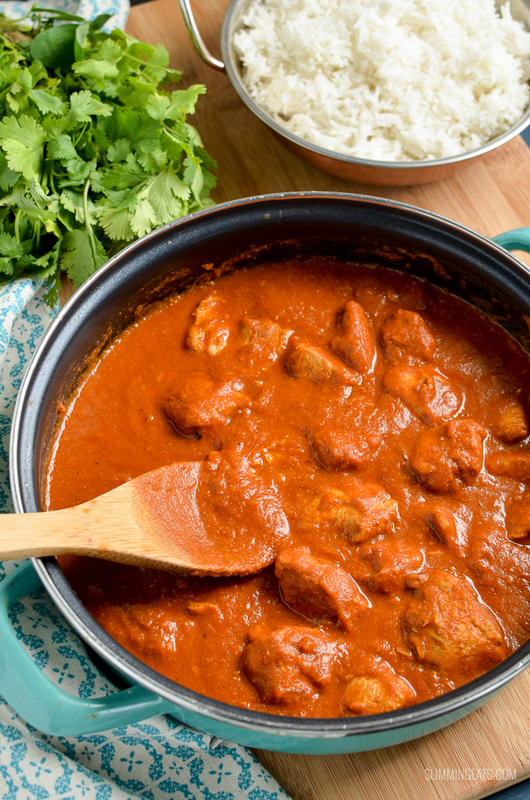 When creating my own version of the popular Butter Chicken, I really thought hard about the ingredients I was going to use and how I was going to cook it. I wanted to make sure it really had all those amazing flavours you expect in Butter Chicken while still keep the syn relatively low. In fact, if you skip the butter in this recipe then it is still pretty darn good and will be completely syn free. But honestly? you can’t have Butter Chicken without butter, it just takes that sauce to a whole other level and is worth the small amount of syns per serving. You will find an additional ingredient in my Butter Chicken that you won’t find in your typical recipe and that is some butternut squash. It may seem like an odd addition, but trust me when I say it works. 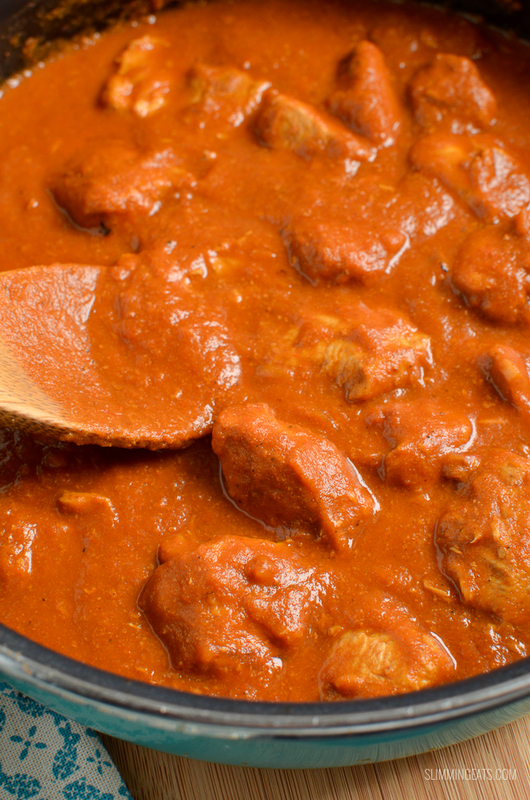 You only use just a small amount, so it won’t overpower the sauce. 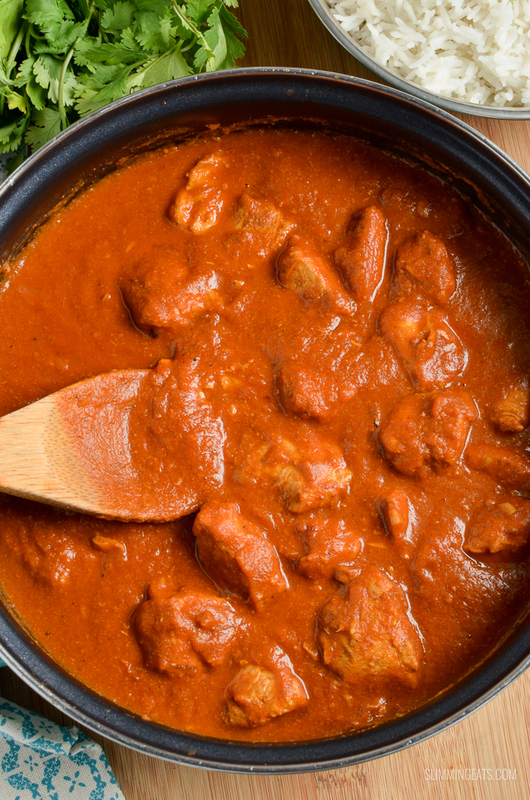 Instead, it makes the sauce lovely and creamy and gives that subtle sweetness without having to add additional synned ingredients to get the perfect Butter Chicken. I use butternut squash often in recipes for adding subtle sweetness without having to use things like sugar etc. It works perfectly in my Chinese Chicken Curry and No Added Sugar Baked Beans as well as this Creamy Butternut Pasta Sauce and Butternut Squash Mac and Cheese. The best thing of all is that butternut squash is a speed food, so use it as often as you can to add some speed foods to your plate. It’s one of my favourite vegetables to roast just with a little bit of cooking oil spray, salt and paprika – yum!! 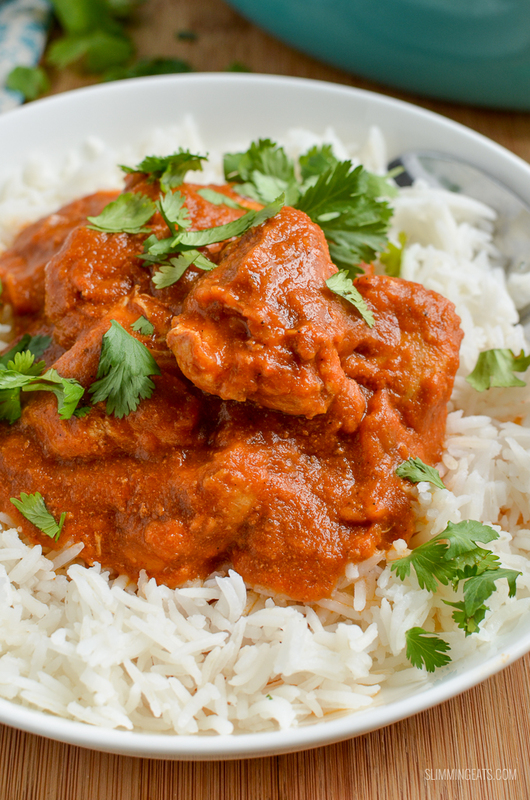 HOW CAN I ADD A 1/3 SPEED FOODS TO THIS LOW SYN HEALTHY BUTTER CHICKEN? 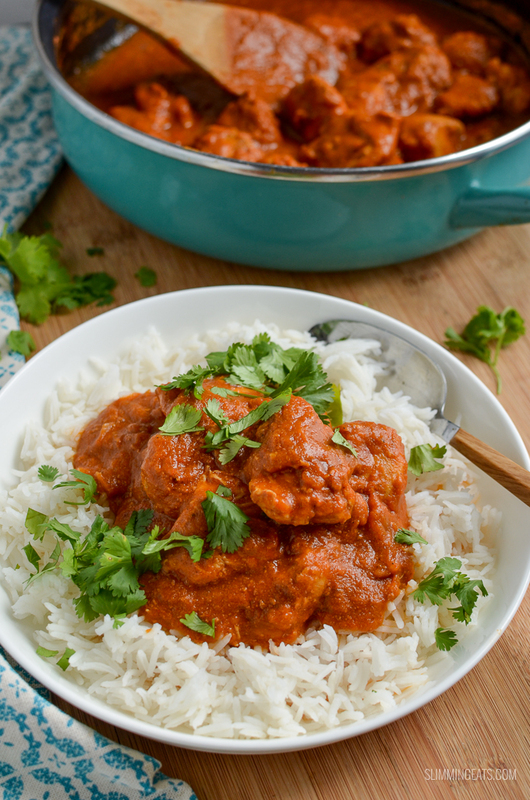 There are of course some speed foods in the sauce to this amazing butter chicken, but if you want to add some additional speed foods, try serving this with my delicious Roasted Cauliflower Rice instead of regular rice. Add the chicken to a lidded dish. Mix together the yoghurt, garlic, ginger, chilli powder, paprika, garam masala and a pinch of salt. Add to the chicken and mix to coat. Marinate overnight in the fridge. When ready to cook, heat a deep frying pan over medium-high heat sprayed with cooking oil spray. Add the chicken in batches and cook until lightly browned and then remove and set aside. Wipe pan clean, spray with some more cooking oil spray, add the onion and fry for a couple of minutes until translucent. Add the garlic, ginger, butternut squash and spices and stir coat. Add in a little bit of the water and reduce down, keep repeating this until onion mixture is softened. Add in the passata and any remaining water and simmer for approx 8-10 mins, then add to a blender and blend till smooth. Add the sauce back to the pan, along with a little bit of water if needed if sauce is too thick. Add in the chicken and stir in the butter. Simmer until chicken is cooked through and tender. Season as needed with salt. Made this tonight and all I can say is WOW! Absolutely delicious. Felt so naughty. Thank you for sharing this recipe. ahh thank you Tracey, so glad to hear that. Hiya, I was just wondering if non dairy yoghurt would work in the marinade? I usually use alpro soya simply plain? I don’t see why a dairy free alternative wouldn’t work. Let me know how it goes.